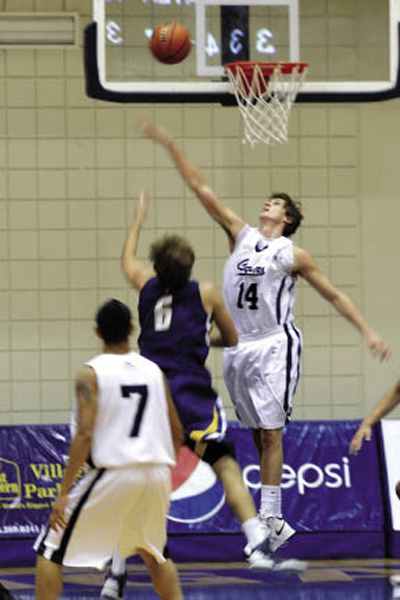 The Cougar mens’ basketball team began their 2012-13 season by hosting the inaugural Calgary Cup Tournament Oct. 11-13, on the Kenyon Court at Mount Royal University. The tournament featured Canada West rivals the University of Calgary Dinos, as well as Mount Royal’s former ACAC rival the SAIT Trojans. The tournament also had several teams across the country participating in this brand new competition. 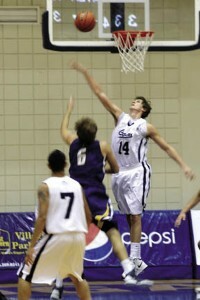 The Cougars began the tournament on Oct. 11 hosting the University of Windsor Lancers. The Cougars managed to stay with their cross-country CIS opponent early on, but ended up being blown out 59-92. “Windsor is a Top 10 program in CIS and has a shot to win it all this year. This was a very good first opponent for us to see where we stand,” Coach Marc Dobell said. “Playing SAIT was okay, but we want to play the CIS schools to see where we fit and how we measure up,” Dobell added. As a result, the Cougs were pushed over to the B-side of the tournament where they squared off against the very familiar SAIT Trojans. The boys cruised easily to a 78-63 victory, pushing them to the B-side finals for the tournament. The B-side finals featured a thriller between Mount Royal and the Brock University Badgers, with the Cougars winning 92-90 in double overtime, pushing them to the B-side championship. With all the worry being centered on Mount Royal’s ability to compete in Canada West with more storied programs, it has to be encouraging to players, coaches and fans that Mount Royal was able to compete and come away with some wins in this tournament. Hopefully, our Cougs’ will be able to steal a few more victories as the year progresses.